Efficient knowledge management drives company performance and quality of service since valuable company knowledge is captured and made available to each employee when needed instantly and in one place. 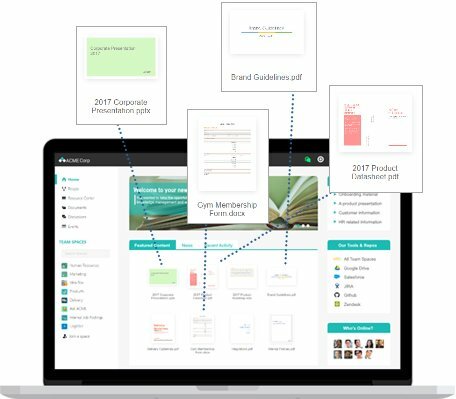 Place relevant knowledge at your employees’ fingertips. Part of your workforce is retiring and taking their valuable knowledge with them. Knowledge base software allows silent knowledge to be captured and promotes efficient knowledge sharing, helping your organization retain and grow its knowledge assets. New workers need quick access to company knowledge to start bringing value quickly. Existing employees need to learn new skills to stay relevant and engaged. eXo’s open source knowledge management software enables them to do so by asking questions, easily finding training material, and much more. A big part of a company’s knowledge base lies within documents. With eXo document management software, employees have access to a secure, collaborative online file system where they can store and share different types of documents. 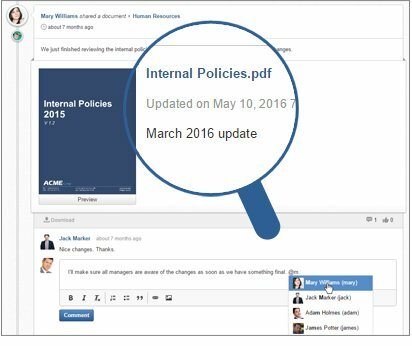 Employees can directly view documents in all popular formats online. Remote editing is facilitated with an online saving capability. eXo documents also includes version control and backup capabilities, helping prevent any loss of valuable data. Enterprise wikis allow organizations to create and maintain sustainable, web-based knowledge bases. 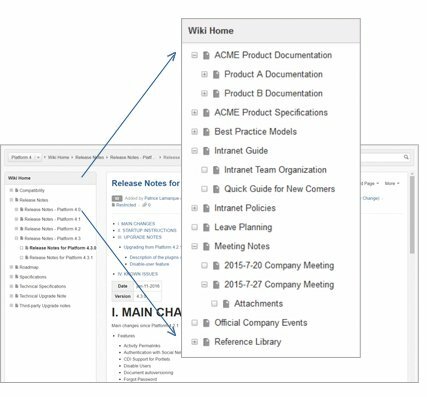 Employees can use wiki pages to write and share procedures, reports, guidelines, project plans, meeting minutes, and more. Wiki pages are particularly useful when knowledge needs to be constantly kept up-to-date and easily accessible. Wikis can make content management and contribution easy for collaborators who can edit the same wiki page to provide the best possible information. Enterprise wikis facilitate visible, relevant knowledge contributions from managers and employees by emphasizing the information and not the format. The biggest and most valuable part of a company’s knowledge lies within the brains of its employees. However, experienced employees usually share their knowledge with only a few coworkers. Other employees may often need to spend time reinventing a wheel that has already been used elsewhere in the organization. Forums give organizations a solution for centralizing and organizing discussions, Q&As, ideas, and more within the framework of one platform. All the knowledge captured is automatically made available and searchable for all generations of employees. Documents, wikis, and forums are all designed for easy information sharing. Knowledge access and sharing is streamlined through the native integration of all the above sources with eXo activity streams. 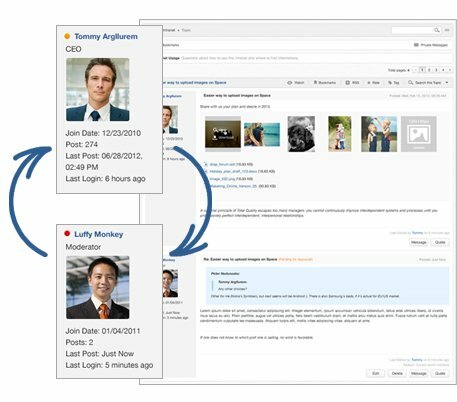 Each employee is notified automatically about activities in his/her teams and network via his/her personal activity stream, such as when documents or wiki pages are shared or updated or when a new question is asked. A manager can check on his/her team’s latest activities in an efficient, interactive manner. Finding relevant information is easy with a unified search engine. Type in a keyword, and the engine will browse the company knowledge base, including documents, wikis, and forums, to find what you are looking for. With permission management, administrators and content creators can fully control content visibility, ensuring the complete privacy of sensitive information as well as maximum visibility and findability for information meant to reach wide audiences. 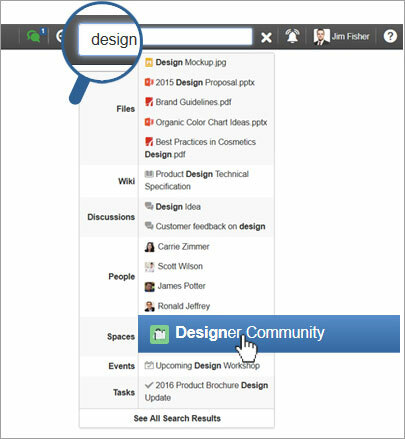 Whether they use the unified search or directly browse the knowledge base, employees only see information that they are allowed to access. Who benefits the most from eXo’s open source knowledge management solution? In deploying eXo’s collaboration solution to our 14,000 agents, our main objectives are knowledge sharing and the decompartmentalization of information.